Sushi is a type of Japanese food made with vinegared rice and other ingredients such as raw seafood, vegetables, and sometimes fruits. There are different types of sushi and two of these are the roll and the hand roll. These two types of sushi are both wrapped in nori, which is edible seaweed that looks like dark green paper wrapping. There doesn’t seem to be much difference between the roll and the hand roll if you were to just look at their names; however, when you read this article, you’ll discover that they actually differ in a lot of ways. A roll is a type of sushi otherwise known as “maki” in Japan. The term “maki” was derived from the Japanese word maku meaning “to wrap or coil.” It is made with Japanese rice, raw fish or other seafood, and vegetables or fruits. All these ingredients are wrapped up and rolled in a whole sheet of seaweed called “nori”, with the use of bamboo mats. The cylindrical roll is then cut into six to eight smaller pieces before being served, making it good for sharing. Chopsticks are used when eating rolls. Since they come in small pieces, they are traditionally eaten in one bite. A hand roll is a type of sushi which is also called “temaki” in Japan. A hand roll is a popular cone-like, casual Japanese food. It is made with a sheet of nori which is usually cut in half and filled with Japanese rice and neta. Neta is what they call the fish, be it salmon, tuna, or other seafood, that is included in the mix. Other preparations do not include rice and sometimes have fruits or vegetables. Hand rolls are prepared by hand and served immediately after being folded. Each piece is about four inches long and is meant for single serving. Hand rolls are traditionally eaten by hand and take more than a single bite to finish. 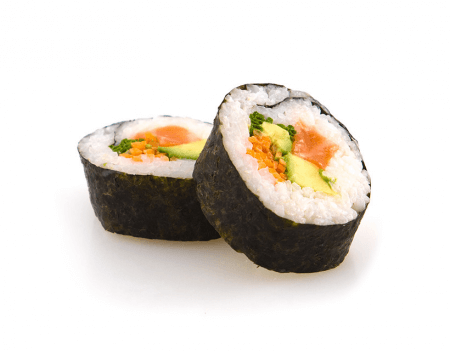 What is the difference between roll and hand roll sushi? Rolls are called “maki” while hand rolls are called “temaki.” Rolls are cylindrical in shape and cut into six to eight smaller pieces before being served. 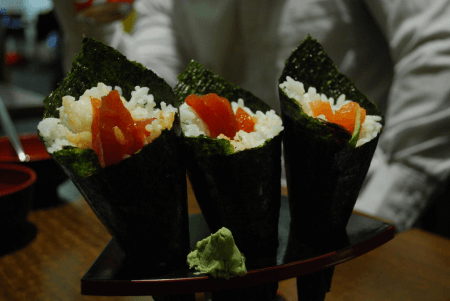 Hand rolls, on the other hand, are cone-shaped, single pieces of casual Japanese food. In terms of size and quantity of ingredients, a single serving of roll is smaller and has less filling compared to a hand roll. Rolls always have rice but hand rolls sometimes do not contain rice. Chopsticks are used to eat rolls and a piece is usually eaten in one bite whereas the hands are used to eat hand rolls and each piece takes at least two bites to finish. Since there are six to eight pieces per serving of rolls, this type of sushi is good for sharing. Conversely, a single serving of a hand roll is always meant for solitary consumption.